With the First Sunday in Advent the Marian hymn following compline changed from the Salve Regina to the Alma Redemptoris Mater. This will be used until the Feast of the Presentation. There are two concluding collects: one for the Season of Advent one that is used from Christmas Eve until the Presentation. The Commonweal blog has a thoughtful reflection on use of the Alma Redemptoris Mater. Loving mother of our Redeemer, gate of heaven, star of the sea, assist your people who have fallen yet strive to rise again. To the wonderment of nature you bore your Creator, yet remained a virgin after as before. You who received Gabriel’s joyful greeting, have pity on us poor sinners. V. After childbirth you remained a virgin. O God, by the child-bearing of the blessed Virgin Mary, you bestowed upon humankind the reward of eternal salvation: grant, we beseech you, that we may experience her intercession, through whom we have been made worthy to receive the author of life, our Lord Jesus Christ, your Son. Amen. As an Orthodox Christian I love what you have said -the icon is beautiful. Nikki, thanks for your comments. 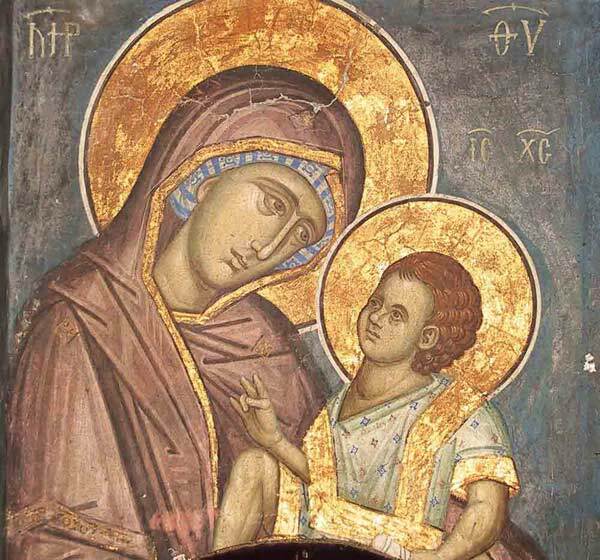 May the holy Theotokos turn our eyes to see her Son and the incarnate life he offers us.